I’m a sucker for ginger, cardamom, and cinnamon used together, whether in savory foods or in sweet desserts. Cinnamon alone is a cliche in American baked goods; it’s so common as to be boring, showing up in everything from breakfast cereals to pies. And ginger on its own can be hot and overwhelming. Cardamom is the subtle, surprising element of the trio, providing lush, lemony notes that flatter the other two. My favorite trio lights up ordinary muffins or quickbreads. 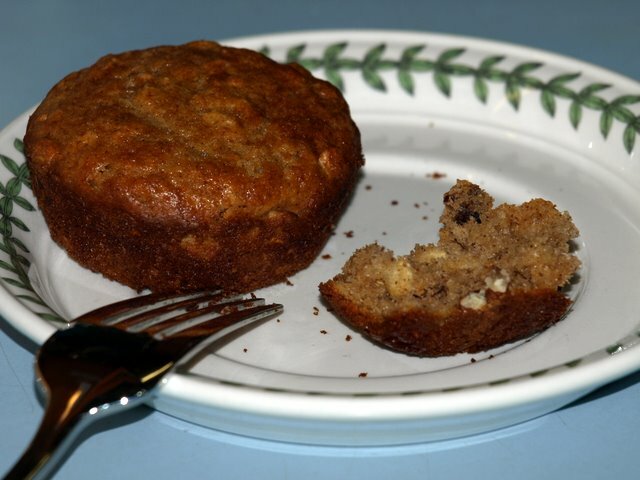 Using King Arthur Flour’s Basic Muffins recipe as a starting point, I added some white whole wheat flour, rolled oats, and pecans to make a slightly sweet, unusually fragrant breakfast treat. Should any muffins make it past breakfast, split and butter the muffins (for extra crunch) before reheating in a toaster oven. Preheat oven to 500 degrees. Lightly grease a 12-cup muffin tin. Combine dry ingredients in a medium bowl until thoroughly blended. In a separate bowl, beat liquid ingredients (milk, butter, eggs) until light in color. Pour the wet ingredients into the dry ones and blend with a fork for no more than 20 seconds. Some lumps will remain. Spoon batter into prepared muffin tin. Place muffins in the oven and reduce heat to 400 degrees. Bake for 17-20 minutes, until a wooden pick inserted into a muffin comes out clean.